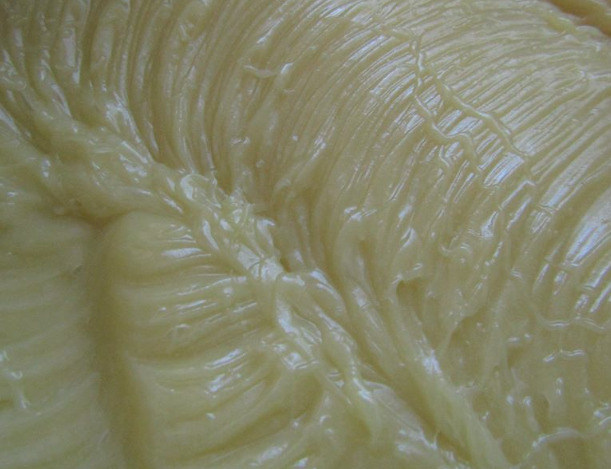 Drench your skin in our luscious and moisturizing Baltic amber rose butter. Let it drink up the lightly fragrant deeply moisturizing pure and mild derma food presented here. Our Baltic Amber Rose Butter begins with the exquisite skin soothing properties of our lovingly grown certified organic roses with the amazing skin cell rejuvenating power of Baltic amber and the rich skin moisturizing actions of natural certified cocoa butter to present you with an exceptionally pure, deeply healing, nourishing, protective and restorative cream. Absolutely heavenly! The results after a short while of using this luscious and rejuvenating cream may astound you. Use sparingly as a little goes a long way. Contains: Certified organic cocoa butter, pure crushed pharmaceutical grade Baltic amber oil, rose oil made with our certified organic roses and pure olive oil, organic rose hip seed oil, essential oils of myrrh and helichrysum, and pure organic Bulgarian rose otto. "Gail, you have outdone yourself this time. i simply cannot get enough of your rose & amber cream! I love the way it melts into my skin, and it smells delicious, too. i admit, i'm a bit stingy with it. i only apply it at night so my hands have time to soak up every last bit, and in the morning they feel soft and nourished. and the jar is the perfect size for stocking stuffing. HINT HINT, santa!" "Oh God! How I love your cream and what it does for my skin!"